We all care about reducing waste to benefit our environment, but not at the cost of our own consumer convenience. Spending time manually pre-sorting the things we throw out is not the most attractive option, especially for busy college students. The EPA estimates that 75% of all waste is recyclable, yet we only recycle 30% of it! Our embedded system hack scans in a piece of trash when thrown away, sending a picture via mobile app to the Google Cloud Platform for image recognition processing. 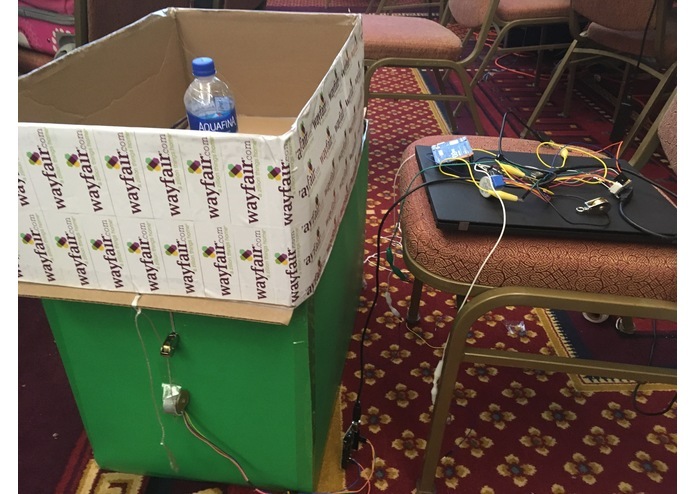 We determine whether this waste item is recyclable, and send that information to an Arduino that controls via servo motor the physical "smart" recycling bin, which moves the trapdoor partition of the bin according to which section the item belongs. An app also tracks binning habits over time and incentivizes users to recycle more by both providing points that can be redeemed for coupons and inciting competition among friends, communities, universities, and cities. Using all ~recyclable materials~ for the physical trash bin (except for the circuitry, of course), servo motors & drivers, Arduino 101s, the Google API Vision cloud service as well as the Google Cloud Storage Platform to handle image processing. An extreme lack of hardware! We reallllllly had to get creative with our materials to make this happen. IT MOVES!! Also, an embedded systems project bringing together our hardware and software-minded folks. AND how dope it looks. All about Google's services (without mentor help), & how to think creatively to bring about a physical hack. We hope to expand it to further sort the recyclables by advancing the API, and have access to CAD and 3D printing of the physical bins for durability. I worked on the hardware/embedded systems end of the hack and created the physical prototype. NASA physicist. Biotech entrepreneur. Penn Engineering student. PennApps organizer. I worked on the backend and hooked it with the Google Cloud API. the project's frontend design + code.